Average Height	: 28" - 32"
Average Weight	: 75 - 110 lbs. Closely related to the Greyhound, the Scottish Deerhound was once known as the Scotch Greyhound, Rough Greyhound and Highland Deerhound. In Scotland it became a district breed in the 16th and 17th centuries and was given the name Scottish Deerhound, and the rough coat was bred in to adapt to the rough climate. They were used as deer hunting dogs for Scottish tribes in the Middle Ages. They became known as the royal dog of Scotland and no one ranking below earl was permitted to own one. Queen Victoria and Sir Walter Scott owned Scottish Deerhounds. With their strict ownership rules the dogs were not very populous in number and took an even harder hit almost to extinction when man invented the gun and the dogs were no longer needed to bring down deer. Two brothers by the name of Archibald and Duncan McNeill saved the breed in the 1800s when they started a breeding program. Once again in Britain during World War II, like many breeds, the dogs fell very low in numbers. It was very difficult to feed the large dogs, and many people destroyed them for food. Along with their great sight, the Scottish Deerhound also has a very fine sense of smell. It is believed that the Scottish Deerhound has been in existence for centuries. In fact, they have been around for so long that it is unclear as to whether they are descended from the Irish Wolfdog or from the Hounds of the Picts. In early years, dogs were named mostly for the function they performed, which is where names like Scottish Deerhound and Irish Wolfdog came from. The Scottish Deerhound, therefore was a dog bred especially for deer hunting in . They had to be of a size that allowed them to successfully take down a buck. In addition, they had to be able to run faster than the deer they were hunting. The Scottish Deerhound was likely bred from Greyhound like ancestors. However, the soft silky hair of the Greyhound would have been unsuitable for the harsh weather of the Scottish highlands. So, the dogs were likely bred to have a wirier and more durable coat as the years went on. It is certain that breeds identified solely for the purposes of hunting deer were in existence in the 16th and 17th century. Many years ago, it was considered very prestigious to own such a dog. At one point, the Scottish Deerhound was considered the "royal dog of", and no one below the rank of an earl was allowed to own one. The breed was held by so few people at one time that it was threatened to become extinct. During the late 1700's the breed found in extremely low numbers. By 1825, breeders had taken on the task of restoring the Deerhound's numbers and the breed rebounded. The methods of deer hunting that the Scottish Deerhounds were trained for were called coursing and stalking. In deer coursing, one or two deerhounds would be brought by the hunter as close to the deer as possible and then slipped out to run the deer down. In deer stalking, the deer was first shot, and then the deer hound was sent out to take the deer down in the event that the shot did not totally take the deer down. Scottish Deerhounds and other Deerhounds were trained to do their hunting very quickly. When coursing a deer, the Deerhound can typically take down the deer in well under four minutes. For this reason, the Deerhound must be an extremely fast runner. •	Gentle, well-mannered, devoted, loyal, polite and affectionate. •	Loving, friendly and excellent with children. •	Very courageous and dignified. •	Despite their size they are not a great watch or guard dog ~ they love everyone! •	Need firm, consistent, confident, calm, training. Can be slow to obey commands. •	Can be funny and willful. •	Friendly with other dogs. •	Not so friendly with other pets. •	Can do OK in apartments but need sufficient exercise. •	Inactive indoors. Like long walks; prefer large, fenced area. •	Have an instinct to chase, so not great in dog parks with other smaller dogs. Scottish Deerhound are very brave and persistent dogs, which is what makes them such great hunters. With people, however, these dogs are regal and quiet, but very friendly and patient. The Scottish Deerhound is likely one of the most polite dogs by nature that you'll ever meet. They are not designed to be watchdogs, as they are too loving to everyone they meet. In fact, many will sleep right through the ringing of your doorbell. However, they can be shy with strangers, and should be socialized early on to avoid them being uncomfortable with visitors in your home. They can become easily stressed and are not happy in homes that are overly noisy or chaotic. They get along quite well with other dogs, but do not do well with other types of pets, because they may have the tendency to chase them. Often, a Scottish Deerhound will behave quite well with a pet cat while the both of them are indoors. However, if both are let outdoors, the cat may immediately become the object of a chase. They can be a bit stubborn and a little slow to obey commands if they are not appropriately trained. It is important to give them a great deal of positive reinforcement during training to instill in them the importance of obeying their master. This breed is particularly susceptible to Bloat, especially if they are fed one large meal each day. For this reason, it's best to feed them 2 or 3 small meals each day and to avoid Exercise right after a meal. They should also get plenty of water. If the bloating problem is not properly managed, it can be life threatening. Scottish Deerhounds have a very wiry coat that is extremely low maintenance. Regular brushing in the direction of the hair growth with a slicker brush will keep the coat in great condition. Some stripping will be required if the dog will be shown. This breed can also be bathed fairly regularly. Bathing will make the coat somewhat softer than desirable for a short period of time, but will help keep it clean and shiny and ensure that the dog has no dog smell. Scottish Deerhounds are average shedders. These dogs need lots of exercise. They love to run and are quite fast. This is the perfect breed for the human runner who wants a companion. A large yard will provide some good exercise opportunities for the Scottish Deerhound, but a good long run on occasion is what this dog really needs. However, he loves the run so much, that he is likely to wander too far. In addition, he may be likely to chase other animals. Though the type of hunting a Scottish Deerhound was bred for is illegal in then, they make good dogs for other types of hunting. They are classified as a sight hound, but have a keen sense of smell, as well. They can be trained as hunting dogs of the type Americans are used to. This is also a great dog for agility activities and racing. Their natural energy level and need for exercise makes them naturals for these activities and they will truly love them. The Scottish Deerhound is a calm and gentle dog, but there are some special training considerations that you must understand with them. First of all, they can be stubborn and slow to obey. They are loving dogs, but are less concerned with pleasing their masters than many other breeds. For this reason, they must be trained early and consistently. They should be crate trained for housebreaking, as they can be a bit slow to house train. Do not allow you Scottish Deerhound to roam the house unsupervised until he is completely housetrained. Keep him in his crate unless you are actively engaged with him and give him plenty of opportunity to go to the bathroom in the appropriate spot. 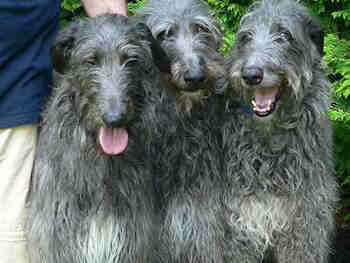 It typically takes 4-6 months to fully house train a Scottish Deerhound. Scottish Deerhounds can be sensitive. They do not function well in households that are very stressful and noisy. They need to live in a very happy and calm household They also do not handle a change in schedule well; so this is not the dog for the frequent traveler. The Scottish Deerhound requires socialization. They can be somewhat timid and standoffish with strangers. Early and consistent socialization will help them feel more comfortable around all types of people. This is particularly important if your family entertains regularly and there are often new people in your home. It is highly recommended that your Scottish Deerhound be enrolled in agility training or lure coursing. Lure coursing allows the dog to chase a mechanized lure around a track or across an open field. These types of activities help keep your Scottish Deerhound healthy and allow him the running opportunity he needs. It's important to understand that these dogs have an innate desire to chase and hunt. They will, therefore, consider any small outdoor animal to be game. If your dog is left alone off leash, he will chase the neighbor's cat and all squirrels and chipmunks he comes across. This tendency is extremely difficult to break. It's best to keep your Scottish Deerhound confined outdoors if he is apt to come across other creatures he might see as a fair chase.